What's that? Don't remember him? There's a good reason. See, he was part of the 1987 line which featured more goofy gimmicky characters. Raptor, who was a falconer, Big Boa, who was a boxer, CrocMaster who was...well, he was a gator wrestler. It was one of those weired years where Hasbro started shifting away from the militaristic theme and more onto science fiction infused storylines. 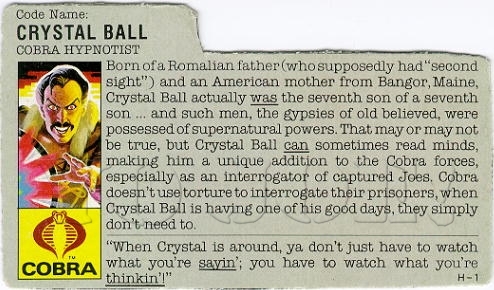 Front and center of this was our boy Crystal Ball, Cobra's resident master hypnotist. Now, looking at him, you can already guess his likeness was based off the legendary Vincent Price, but last I checked, Vincent Price didn't run around with a giant 4 foot lenticular disc and forced people to squawk like a chicken. How is hypnotizing GI Joe's useful in the battle field? Search me, brother. Maybe Crystal Ball caught Leatherneck during a piss break and told him to bring him mashed potatoes. I don't know. 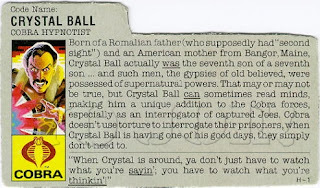 Now, as it's told, Crystal Ball was pitched to Hasbro by Stephen because his son Owen was such a huge fan of the line. He apparently pitched the character origin and even writing his filecard. 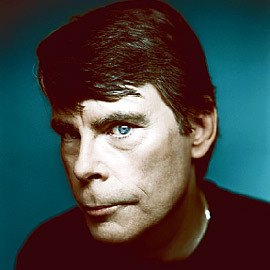 It's later been disputed that his son Owen was the one who came up with the character and suggested it to his dad to pitch. Either way, the name King will always be responsible for this character. Which makes sense seeing as it's one of the most creative yet bizarre characters, even if he was the most maligned. Interesting sidenote: Owen King was blessed with a character in his likeness and name! 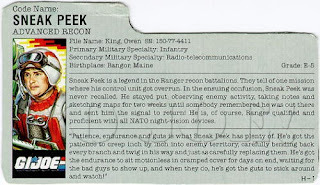 Sneak Peak was also released in 1987, with an origin of Bangor, Maine and his file name being Owen King. Which makes sense as it could've possibly been an agreement between the King family and Hasbro as a weird payment for Crystal Ball. As lame as Crystal Ball is, I'd gladly accept a character in my honor. It's never been 100% confirmed, but that's what I've always heard. Well that was freakin' awesome! Thanks for the input man!